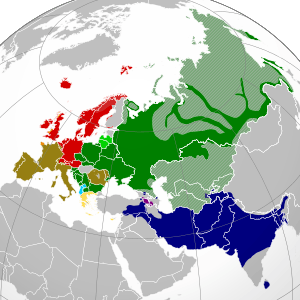 The Indo-Iranian languages or Indo-Iranic languages, or just Aryan languages, constitute the largest and easternmost extant branch of the Indo-European language family. It has more than 1 billion speakers, stretching from the Caucasus (Ossetian) and the Balkans (Romani) eastward to Xinjiang (Sarikoli) and Assam (Assamese), and south to the Maldives (Maldivian). The common ancestor of all of the languages in this family is called Proto-Indo-Iranian—also known as Common Aryan—which was spoken in approximately the late 3rd millennium BC. The three branches of modern Indo-Iranian languages are Indo-Aryan, Iranian, and Nuristani. Additionally, sometimes a fourth independent branch, Dardic, is posited, but recent scholarship in general places Dardic languages as archaic members of the Indo-Aryan branch. Most of the largest languages (in terms of native speakers) are a part of the Indo-Aryan group: Hindustani (Hindi–Urdu, ~590 million), Bengali (205 million), Punjabi (100 million), Marathi (75 million), Gujarati (50 million), Bhojpuri (40 million), Awadhi (40 million), Maithili (35 million), Odia (35 million), Marwari (30 million), Sindhi (25 million), Rajasthani (20 million), Chhattisgarhi (18 million), Assamese (15 million), Sinhalese (16 million), Nepali (17 million), and Rangpuri (rajbanshi) (15 million). Among the Iranian branch, major languages are Persian (60 million), Pashto (ca. 50 million), Kurdish (35 million), and Balochi (8 million). Numerous smaller languages exist. A basic chart of the Indo-Iranic languages. The oldest attested Indo-Iranian languages are Vedic Sanskrit (ancient Indo-Aryan), Older and Younger Avestan and Old Persian (ancient Iranian languages). A few words from another Indo-Aryan language (see Indo-Aryan superstrate in Mitanni) are attested in documents from the ancient Mitanni kingdom in northern Mesopotamia and Syria and the Hittite kingdom in Anatolia. ↑ Hammarström, Harald; Forkel, Robert; Haspelmath, Martin; Bank, Sebastian, eds. (2016). "Indo-Iranian". Glottolog 2.7. Jena: Max Planck Institute for the Science of Human History. ↑ Mahulkar, D. D. Pre-Pāṇinian Linguistic Studies. ↑ Puglielli, Annarita; Mara Frascarelli. Linguistic Analysis: From Data to Theory. ↑ Džoj I. Edelman (1999). "On the history of non-decimal systems and their elements of Aryan languages". In Jadranka Gvozdanović. Numeral Types and Changes Worldwide. Walter de Gruyter. p. 221. ISBN 9783110161137. Retrieved 2013-01-02. ↑ Edwards, Viv. "Urdu/Hindi Today". BBC. ↑ Thompson, Irene. "Bengali". AboutWorldLanguages. Retrieved March 29, 2013. Nicholas Sims-Williams, ed. (2002). 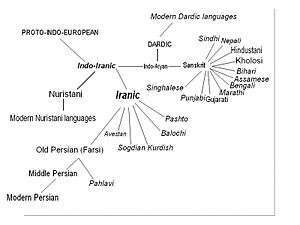 Indo-Iranian Languages and Peoples. Oxford University Press. Look up Indo-Iranian Swadesh lists in Wiktionary, the free dictionary. Wikimedia Commons has media related to Indo-Iranian languages.